I had no idea! They attack….viciously and continuously! I would have to hide and run for cover. Who would have thought that gals with pedicures were in danger down on the farm…from the chickens! Yes, it seems that they like bright red and shiny toes! That was how I was introduced to Prairie Fruits Farm by one of the owners, Wes Jarrell. Prairie Fruits is located in southern Illinois near Champaign/Urbana. The farm produces small batch, hand crafted, artisan cheeses which some say are among the finest in the US and is purveyor to some of the best restaurants in Chicago and beyond. Thankfully, the goats are a lot less blood thirsty….in fact, they’re down right sweet. Since it’s a dairy farm, almost all of them are girls…with the exception of a couple of sassy looking billy goats. The girls (who all have names) come right up to you and want to investigate and perhaps get a pet or two. They did seem to want to nibble anything that you are holding (probably thought we had treats). I really believe that one of them was trying to kiss Jeff…jealous! I was very impressed by their environment. It was about 95 degrees that day and “the girls” had more fans in their area than we had in ours! Shade, fans, and sweet hay….I could swear that one of them was smiling. I discovered that they only eat the finest locally grown hay and alfalfa to supplement their forage based diet. No wonder that Prairie Fruits is Animal Welfare Approved. 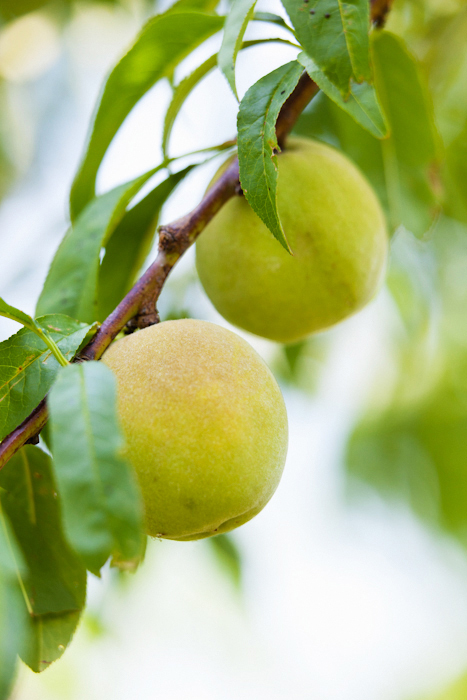 Prairie Fruits also is home to fragrant fruit orchards, thorny berry patches, lush pastures and hay fields, and of course flowering prairies. We (Jeff/photographer; me/prop stylist) were there on assignment to take pictures for famed Chicago chef, Paul Virant’s ,new cookbook that he is writing with Kate Leahy (of A-16 fame). He was there as celebrity chef for one of Prairie Fruits famous Dinners on the Farm. These dinners are held from May through December and feature a variety of different themes and menus. I loved the fact that attending the dinner were multi-generation families enjoying themselves very much in the Sunday Supper tradition! Prairie Fruits has one of the largest wood fired grills that I had ever seen and it was to be the focal point for the preparation of many of the mouth watering dishes that chef Virant would be cooking that day. The food was beyond tasty….stay tuned to when his cookbook will be released featuring canning, pickling and the kind of soul satisfying dishes that will have you licking your fingers! 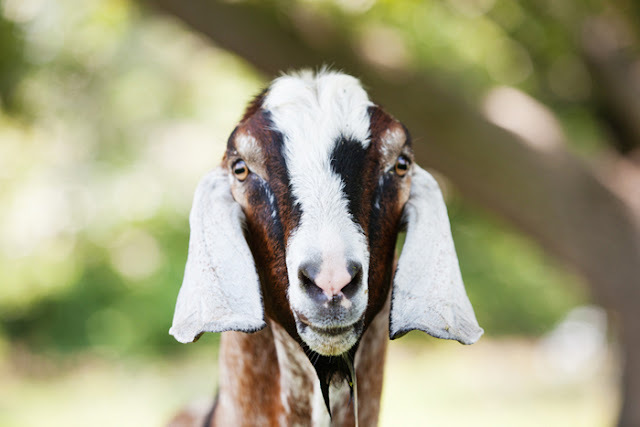 I don’t know if I can even describe just how delicious their cheese is….I think it reflects the “good life” the goats have…lots of love and great nibbles that produce great milk and a great product. If you can find it, treat yourself to some…it’s well worth it. I hope that you find that this combo is perfect with the beautiful summer vegetables that are available when you get together with family and/or friends for your next Sunday Supper. I love the taste of oven roasted beets, so I decided to roast these before grilling them. Actually I only grilled them to give a bit of "grill flavor" on top of their roasted flavor. Preheat oven to 400 degrees. Wash beets and cut off the ends, but do not peel. Drizzle with 1 tablespoon olive oil. Bake beets till fork tender (about 30 minutes). Let cool then peel and slice. Sprinkle with olive oil, salt, pepper and thyme. 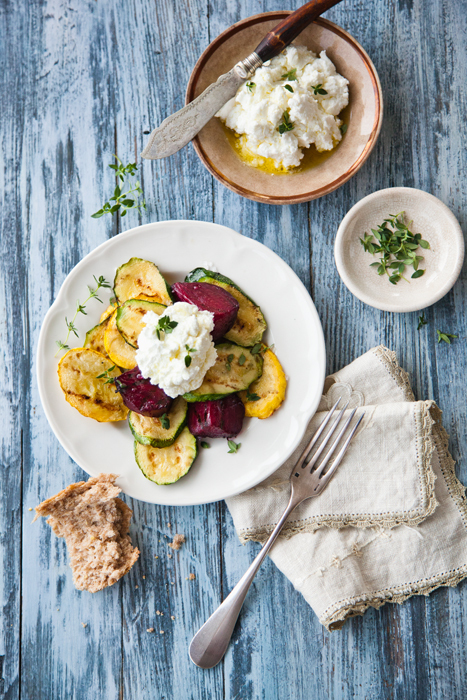 Slice zucchini and yellow squash and sprinkle with 1 tablespoon olive oil, salt, pepper and thyme. Grill for about 2 1/2 minutes per side till golden. 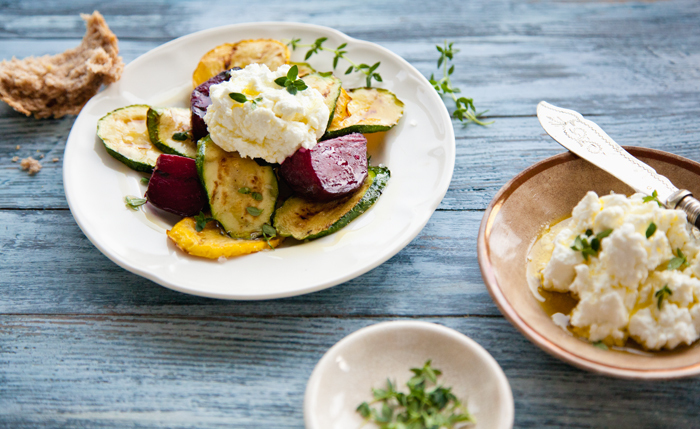 Remove from grill, splash with a bit of balsamic vinegar, add a dollop of goat cheese, a drizzle of olive oil, a bit more thyme and you're all set.